“Joe Campbell said his cancer diagnosis was the catalyst for Crossing Borders, a collection of his poems and paintings produced over the past 20 years and more,that makes you inclined to read and look in a certain way, to see this work as a summation, to consider it in a fading light. 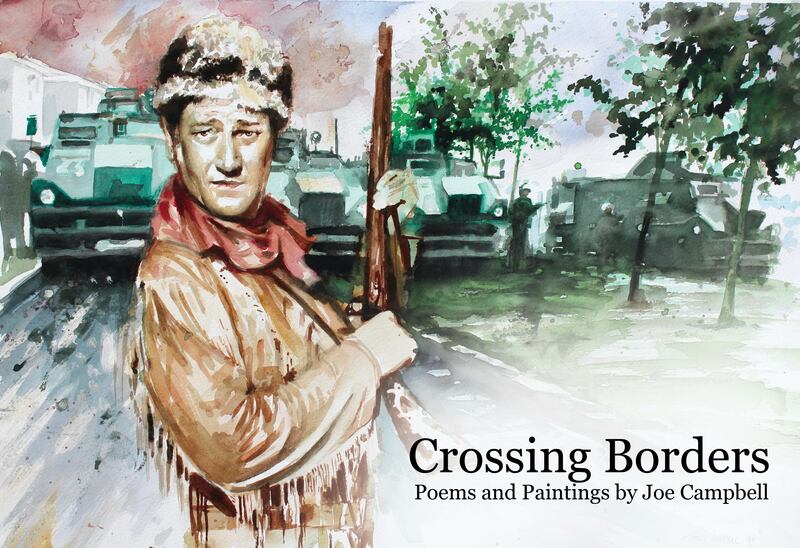 Crossing Borders is a debut collection of poems by artist Joe Campbell. A unique tapestry of beautiful images and honest experience, it is an artist’s view of life. It is also deeply personal. 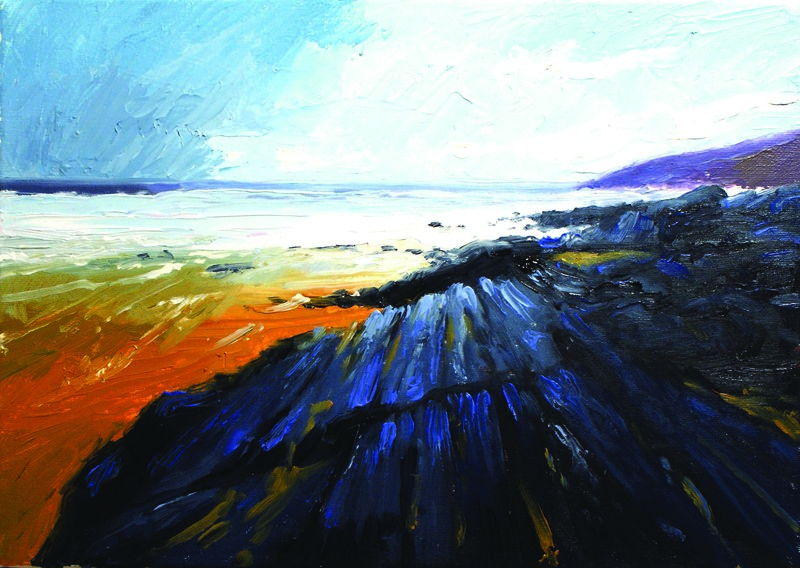 Described by Campbell himself as “more like painting with words than creating verse” the poetry deals with difficult, stark, life experiences such as: cancer; the troubles and bereavement and juxtaposes verse with paintings gleaned from over twenty years of professional work. Born and reared in his native city of Derry, Campbell’s painting also reflects a deep sense of place. The images are portraits of a city and its hinterland and pay homage to its natural beauty. The collection is a blend, with poems that draw on history, distant memory and emotion and with paintings that seek to provide a visual respite and establish an empathy and common ground with the reader.Crossing Borders is above all human, deeply rooted in real life experience, a collection born out of trauma. Irish Landscape, Ancient Castle at Greencastle. Sunshine and shadow describes this painting of an old weathered fence post with brambles and wild briar nestling in the shadow of an old oak tree. The location was an area just outside Derry City, Ireland, an area of farmland situated close to a range of low lying hills. 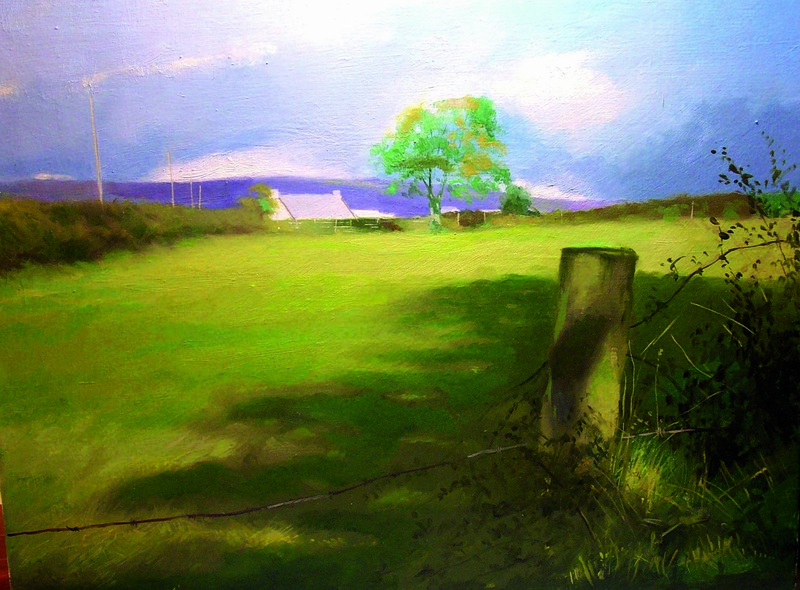 The painting was captured in the late on a summers evening as the sun was setting. The long shadow cast by the oak provided the visual interest making it worthy of a painting.? What to paint? That’s the difficult question in painting. I always have a strategy before I set out. Look for something of interest in : the foreground; the mid ground and the background. Then look for lines that lead the eye up through those three areas. Always have a plan before you set out to look for potential scenes to paint. Taking a camera with you will help. The camera viewfinder will act as a frame for the scene in front of you making it easier to capture fleeting opportunities such as the passing conditions in the scene above. The post in the foreground is positioned about two-thirds across the front of the picture. In terms of Composition this is known as the rule of thirds. The post would look “wrong” if positioned in the centre of the scene. The Post and the surrounding brambles, fence wires etc also provide focal interest at the front of the painting. In addition, the deep shadow cast by the tree makes for a very strong colour and tonal area which is in contrast to the bright mid ground and background. Devices like these can lend a sense of depth or distance to a painting.